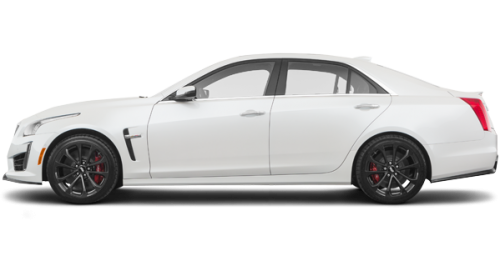 Finance the 2019 Cadillac CTS-V Sedan at 2.99% APR and get $2,500 in credits. 1 Offer valid at participating dealers to eligible retail lessees in Canada who have entered into a lease agreement with GM Financial and who accept delivery between April 2, 2019 and April 30, 2019 of an eligible 2019 Cadillac XT4 AWD sport (6ZB26-1SC). Lease based on suggested retail price of $40,964. Bi-weekly payment is $228 for 48 months at 3.9% interest rate on approved credit to qualified retail customers by GM Financial. $3,200 down payment is required. Total obligation is $26,927, plus applicable taxes. 16,000-kilometer allowance; charge of $0.16/km for excess kilometers. Cost of borrowing is $4,375. Taxes, license, insurance, registration and applicable fees, levies, duties and, except in Quebec, dealer fees (all of which may vary by dealer and region) are extra. Option to purchase at lease end is $18,412. See dealer for details. Discounts vary by model. Dealer may sell for less. Limited time offer, which may not be combined with certain other offers. General Motors of Canada Company may modify, extend or terminate offers in whole or in part at any time without notice. Conditions and limitations apply. Offers may not be redeemed for cash and may not be combined with certain other consumer incentives. 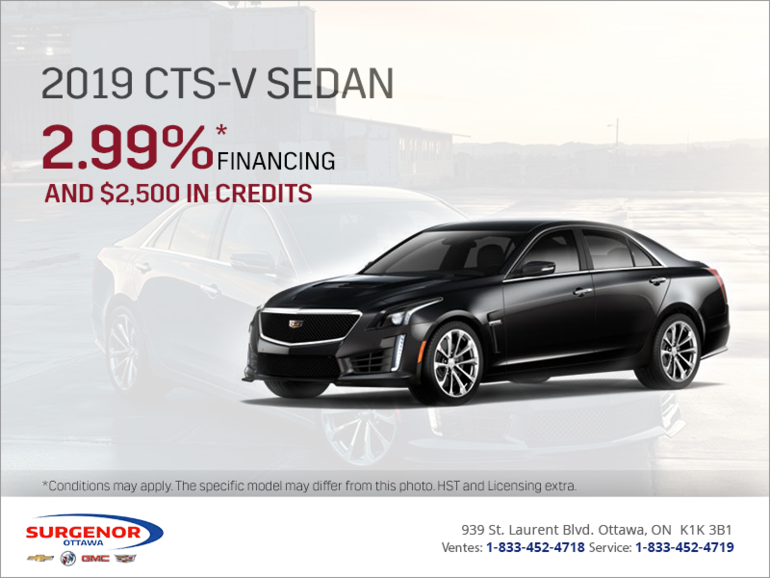 2 Offer valid at participating dealers to eligible retail lessees in Canada who have entered a lease agreement with GM Financial and who accept delivery between April 2, 2019 and April 30, 2019 of a 2019 Cadillac XT5 (6NF26 - 1SC) . Lease based on suggested retail price of $46,964, includes $1,000 manufacturer-to-dealer Credit (tax exclusive) for an eligible new 2019 XT5 at participating dealers. Bi-Weekly payment is $248. Total lease obligation is $29,691. 16,000-kilometer allowance; charge of $0.16/km for excess kilometers. Cost of borrowing is $2,372. Taxes, license, insurance, registration and applicable fees, levies, duties and, except in Quebec, dealer fees (all of which may vary by dealer and region) are extra. Option to purchase at lease end is $19,645. Conditions apply. Taxes, license, insurance, registration and applicable fees, levies, duties and, except in Quebec, dealer fees (all of which may vary by dealer and region) are extra. 3 Offer available to qualified retail customers in Canada for vehicles delivered between April 1, 2019 April 30, 2019. 0% purchase financing offered on approved credit by TD Auto Finance Services, Scotiabank® or RBC Royal Bank for up to 60 months on a new 2019 Cadillac Escalade. Model shown may include optional equipment available at extra cost. Participating lenders are subject to change. Rates from other lenders will vary. Down payment, trade and/or security deposit may be required. Total Value consists of $2,000 manufacturer-to-dealer credit (tax exclusive). Monthly/Bi-weekly payment and cost of borrowing will vary depending on amount borrowed and down payment/trade. Example: $20,000 at 0% APR, the monthly payment is $278 for 72 months. Cost of borrowing is $0, total obligation is $20,000. Freight and air tax ($100, if applicable) included. Please see your dealer for the most accurate and up-to-date product and pricing details. ®Registered trademark of The Bank of Nova Scotia. RBC and Royal Bank are registered trademarks of Royal Bank of Canada. 3b Offer valid at participating dealers to eligible retail lessees in Canada who have entered into a lease agreement with GM Financial and who accept delivery between April 2, 2019 and April 30, 2019 of a 2019 Cadillac Escalade. Lease based on suggested retail price of $95,564, includes a $2,000 Cash Credit (tax exclusive) for an eligible new 2019 Escalade at participating dealers. Limited time lease offer available on approved credit. Representative lease example based on a vehicle price of $95,564. 1.9% lease APR for 48 months. Monthly payment is $1,100. Total lease obligation is $57,710. 16,000-kilometer allowance; charge of $0.16/km for excess kilometers. Conditions apply. Taxes, license, insurance, registration and applicable fees, levies, duties and, except in Quebec, dealer fees (all of which may vary by dealer and region) are extra. Option to purchase at lease end is $42,907. 4 Offers apply as indicated to the lease of 2019 CADILLAC CT6/XTS/CTS new or demonstrator models delivered on or before 2019-04-30. 2.99% purchase financing offered on approved credit by TD Auto Finance Services, Scotiabank® or RBC Royal Bank for up to 72 months. Model shown may include optional equipment available at extra cost. Participating lenders are subject to change. Rates from other lenders will vary. Down payment, trade and/or security deposit may be required. Monthly/Bi-weekly payment and cost of borrowing will vary depending on amount borrowed and down payment/trade. Total Value consists of $$5,000/$2,500/$2,500 manufacturer-to-dealer Winter Bonus Credit (tax exclusive). Freight and air tax ($100, if applicable) included. Please see your dealer for the most accurate and up-to-date product and pricing details.®Registered trademark of The Bank of Nova Scotia. RBC and Royal Bank are registered trademarks of Royal Bank of Canada.While we try to ensure accuracy, we reserve the right to correct any errors in pricing or descriptions, and to cancel or refuse to accept a purchase based on an incorrect price or description listed online. Please see your dealer for the most accurate and up-to-date product and pricing details. **The Cadillac Premium Care Maintenance Program (“Program”) is available to eligible customers (retail and fleet) in Canada who have purchased/leased/financed and taken delivery of an eligible new 2018 Cadillac model from an authorized Cadillac dealer. The Program commences at time of delivery and lasts for 4 years or 80,000 km (whichever occurs first) (“Term”). During the Term, eligible customers are eligible to receive the following services (“Services”) on their qualifying Cadillac model: (i) Scheduled Maintenance [includes: GM dexos1 ™ oil and oil filter change (maximum 8 times per Term); numerous inspections, tire rotations (if required, to a maximum of 8 times per Term) and other services – see dealer for a complete list]; (ii) replace engine air cleaner filter [maximum 1 time per Term]; (iii) replace passenger compartment air filter [maximum 2 times per Term]. Brakes, wheel alignments and other dealer recommended maintenance or customer requested maintenance that differs from the Services covered by the Program are excluded. Dealers will determine eligibility for the Program. This offer may not be redeemed for cash and may not be combined with certain other consumer incentives available on Cadillac vehicles. General Motors of Canada Company reserves the right to amend or terminate this offer, in whole or in part, at any time without prior notice and without incurring any liability. Additional conditions and limitations apply. See dealer for details.